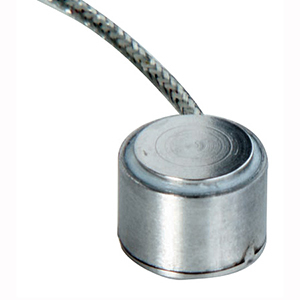 Small in size but not in performance, the LCM307 Series "Top Hat" load cell is designed for applications with minimum space and high capacity loads up to 500,000 Newtons. Rugged all stainless steel construction and high performance strain gauges assure superior linearity and stability. Temperature compensation is achieved through a miniature circuit board in the load cell’s cable. This unit is designed to be mounted on a smooth, flat surface. The LCM307 is also available in imperial configurations, with 0-250 to 0-100,000 lb ranges. Please see the LC307 for complete details, or contact our Technical Sales department for more information.. Note: A 5-point NIST traceable calibration is included.